from the blue chair: Finished! I finished sewing all the rows together tonight. I'm honestly feeling a bit "meh" about it. I think I have been working on it too long. It might get put away for a bit while I think about how to piece the back. I'm tired of looking at 2" squares. oh no... you feel *meh* about it! I often feel that way about quilts though until I get them quilted, bound, washed, and photographed. All those steps bring them back to life. It's really amazing work you've done there. Wow. That is an amazing quilt and it looks so complicated! Good work, Kati! I think it's incredible, I wouldn't even attempt 2" squares! Well done for finishing, I'm in awe of your stamina!! I'm sure you'll love it when you pull it out again. I love it! I think you did a fabulous job. I'm not sure I could have endured to the end on that one. It is really a work of art. OMG... i love it! NO "meh" 's about this quilt..it is awesome. All those two inch blocks added up to WOW! That looks absolutely fantastic. I can see feeling meh about it. How did you not dream about 2" squares every night? Or just see them everywhere you look? This looks amazing! I know what you mean about looking at it for too long...put it away for a week or so and pull it out and I'm sure you'll be just as amazed. 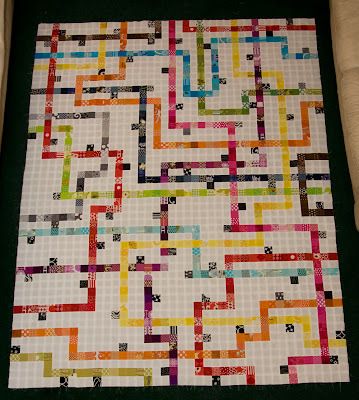 Congrats on finishing it, and the fact that your not cross eyed from staring at all those 2 inch squares! I definitely think you've just been looking at it too long ... that happens to me too. I think it's incredible! Amazing work! Wow! I can't believe you finished it. I wasn't going to touch that one with a 10 foot pole. It looks awesome! Awesome! I hope you are bringing it on Thursday so we can oogle in in person! It is absolutely stunning...I am sure you'll see the beauty in it after a quick rest. Such an accomplishment. p.s. Come on over and share your home-made halloween costumes! You did it!! It is absolutely stunning. I can imagine how tired you are looking at 2" squares. I hope that you will be able to complete it binding and all some time in the near future!